Have you ever seen this photo of me as an 18-year-old? I know, my hair was ridiculous, but whatever. It was a huge moment because I had just snagged my 1,000th ball. 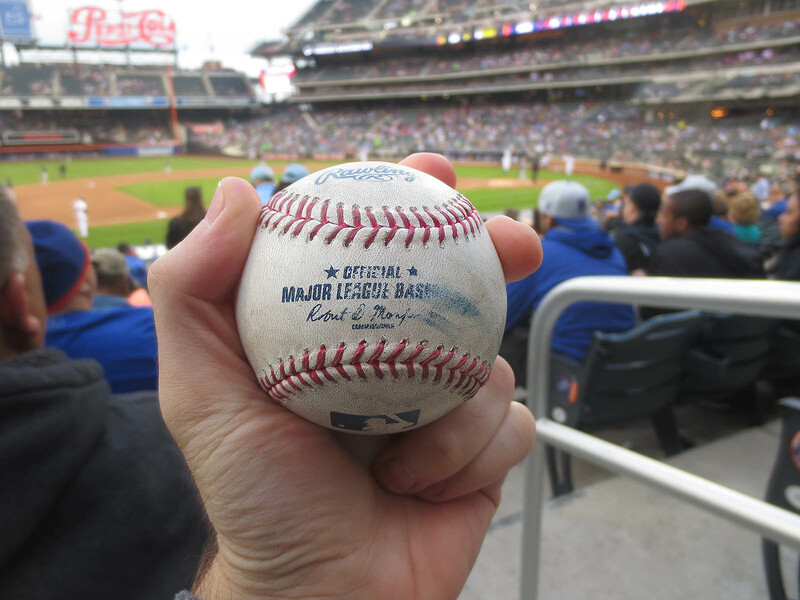 Braves pitcher Pedro Borbon Jr. threw it to me on June 11, 1996 at Shea Stadium — and I’ll never forget it. Nearly seven years later, on May 24, 2003 at Olympic Stadium, Phillies pitcher Joe Roa threw me my 2,000th ball. 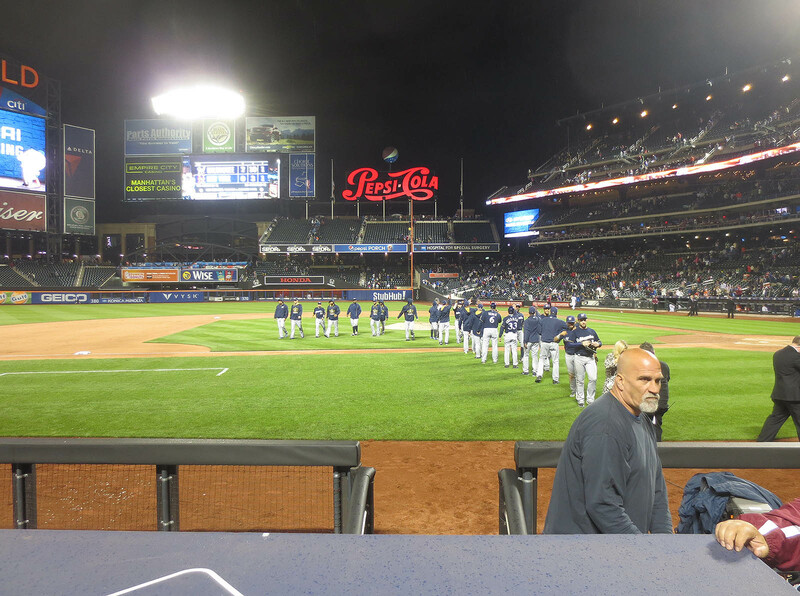 On May 7, 2007 at Yankee Stadium, my dad was with me when I used my glove trick to snag my 3,000th ball. Ball No. 4,000 was a toss-up from Mets pitcher Livan Hernandez on May 18, 2009 at Dodger Stadium. My 5,000th ball required more athleticism than the others; it was an Alex Rios BP homer that I caught on the fly on May 28, 2011 at Rogers Centre, and look, here’s a video of it! Nationals pitcher Brad Lidge tossed me my 6,000th ball on June 8, 2012 at Fenway Park, and I hired a videographer to document the entire day. 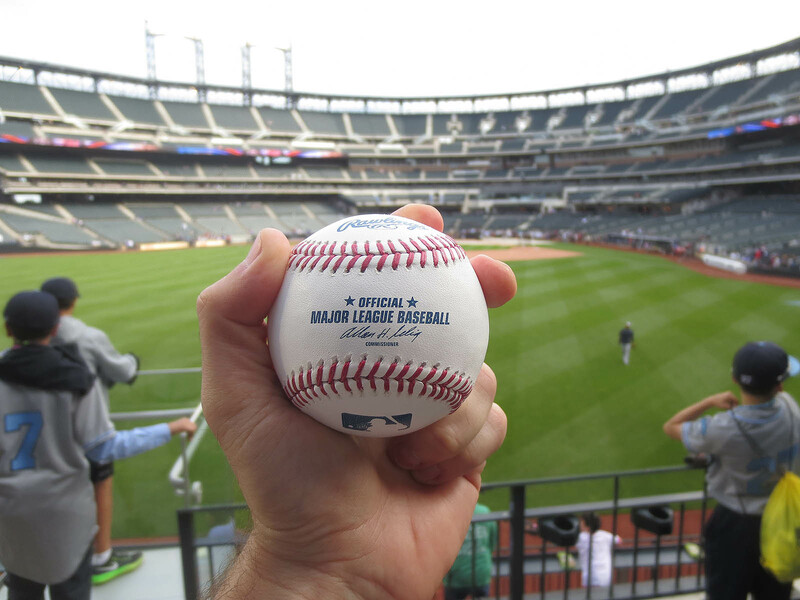 The following season, on August 27, 2013 at Nationals Park, I filmed myself catching an Anthony Rendon BP homer for my 7,000th ball. What about No. 8,000, you ask? 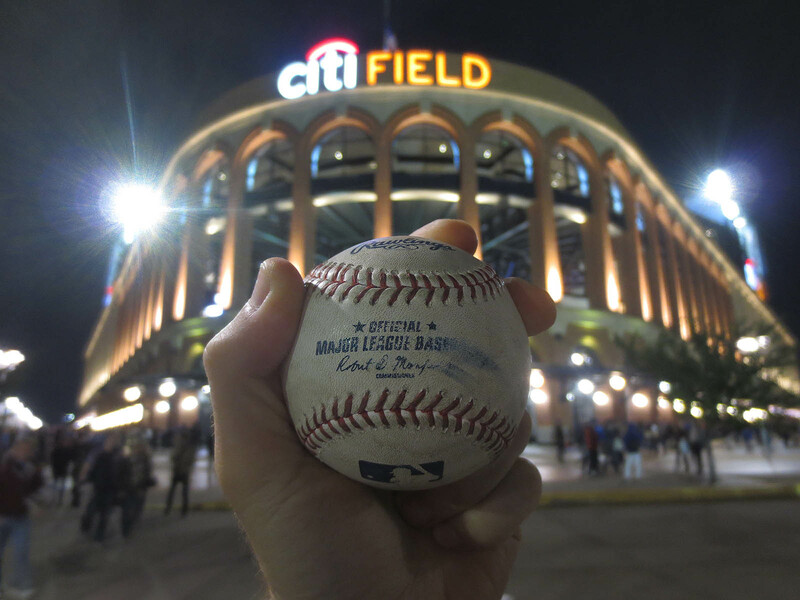 Well, after snagging 16 balls on 5/13/15 at Citizens Bank Park, I began this day at Citi Field with a lifetime total of 7,996. 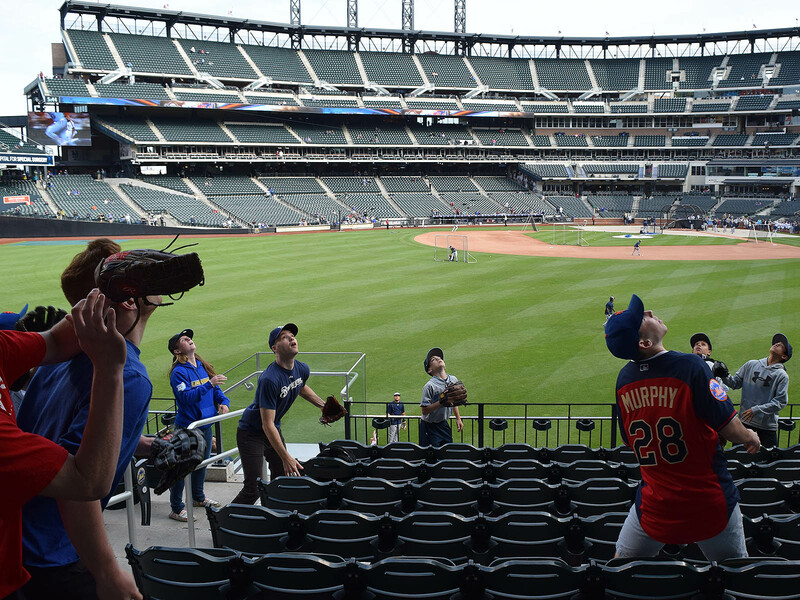 My girlfriend, Hayley, proud owner of a fancy new camera, offered to join me at batting practice and film the big moment — but I had to do it during BP because she had evening plans and had to leave before the game started. I had the place to myself for a minute, but of course there was no action. That’s to be expected when Ruben Tejada is hitting, but what about the 6-foot-6 John Mayberry Jr. or the muscular Anthony Recker? You’d expect some bombs from those guys, right? They always hit in the last group (which is the only group after the gates open), and guess what? It’s always dead. That was some sort of mesh netting. Why the hell was it on the staircase during BP? Why did it take five minutes for someone to finally come and remove it? The Mets are weird. That’s all I can say. As the Brewers finished playing catch, I moved closer to the field . . .
. . . and eventually got Khris Davis to throw me a ball from more than 100 feet away. To catch it, I had to lunge over a railing and reach down as far as possible into the “handicapped” section. Not only did the ball have a blue Sharpie streak on the sweet spot (that’s how the Brewers mark them), but it had the stamped signature of former commissioner Bud Selig. Yuck! I wanted my 8,000th ball to feature new commissioner Rob Manfred, and I wanted the sweet spot to be clean so I could try to get it signed. 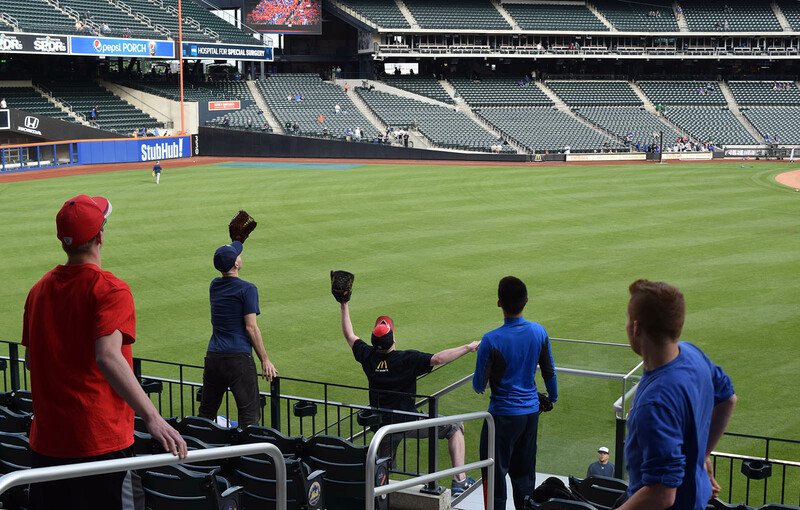 In the photo above, do you see the other guy reaching up with his glove? 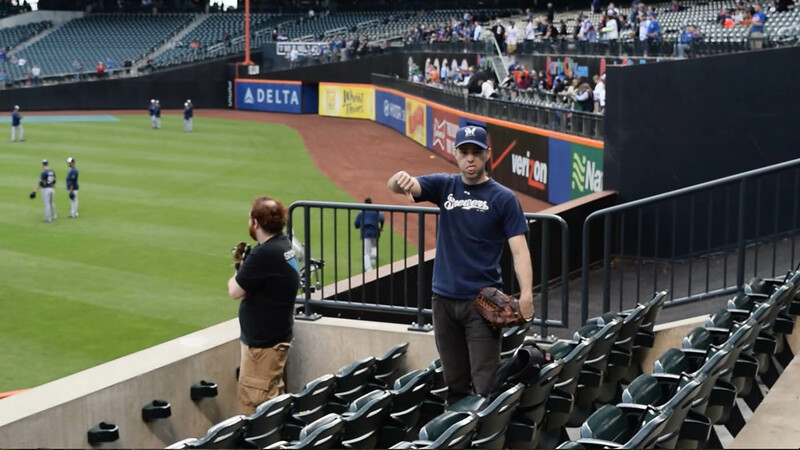 He was in the perfect spot when the ball was hit, but he misjudged it slightly and maneuvered himself out of position by drifting down the steps. 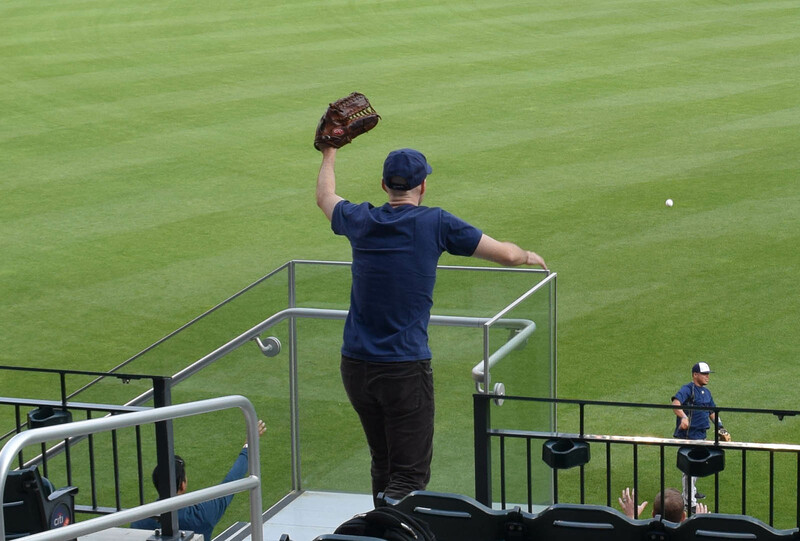 Moments later, I scrambled for another home run ball that landed in the seats . . .
. . . but didn’t get there in time. I didn’t know what would be worse — having No. 8,000 be a Selig ball or having it be hit by someone as disgusting as Ryan Braun. That was my third ball of the day and No. 7,999 lifetime. I updated my notes . . . It barely helped. She was still freezing. The second group of Brewers BP was dead. Hayley used a lot of battery power and wasted several gigs’ worth of space on her memory card by filming a whole lotta nuthin’. The same thing happened in the third group. The seats were crowded, and the Brewers just weren’t hitting anything. Long story short: when BP ended, I was still stuck at 7,999 and Hayley — shivering yet apologetic — left the stadium. I felt bad. Really REALLY bad. I had wasted her time and lost an opportunity to have my special moment captured on video. But then something clicked inside my brain. It occurred to me that I had a rare opportunity for No. 8,000 to be a game-used ball. I had snagged all my other milestones during BP or other pre-game warm-ups, and now here I was . . . one ball away with the game set to begin. As it turned out, I wouldn’t have gotten that ball anyway. Hector Gomez ended up with it and tossed it to a group of boisterous Latino men who’d been shouting at him in Spanish — no way to compete with that. 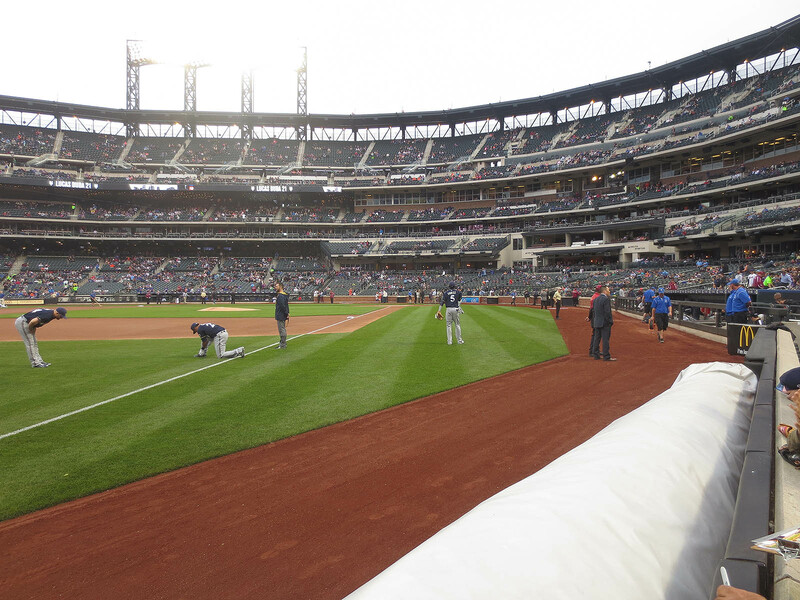 When the Mets took their positions, I began making my way toward the dugout. I figured I’d inch a little closer . . . and a little closer . 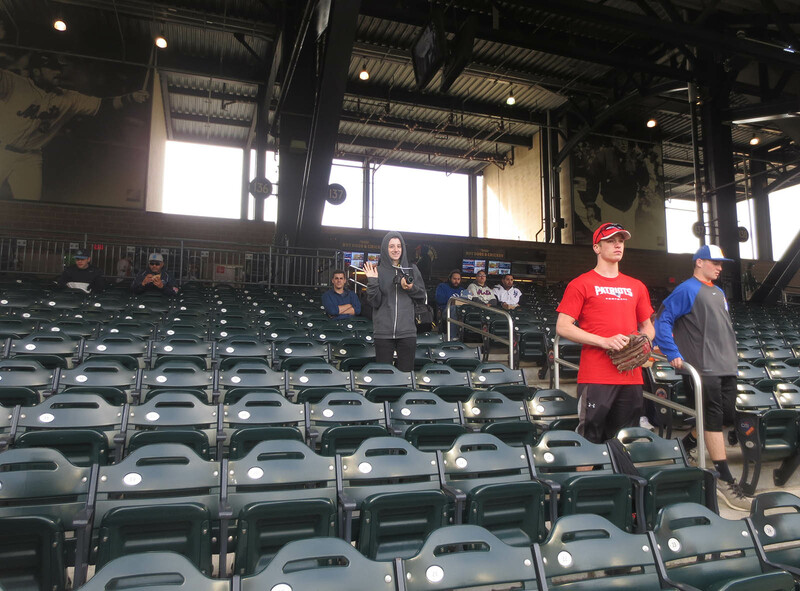 . . and by the time the Brewers jogged off the field after the first inning, I’d be in a good spot to get a 3rd-out ball. Then I’d have more chances throughout the game, and hell, if I still hadn’t snagged my 8,000th ball by the very end of the night, I could try getting it from the home plate umpire. THAT would be an interesting way to notch my milestone. 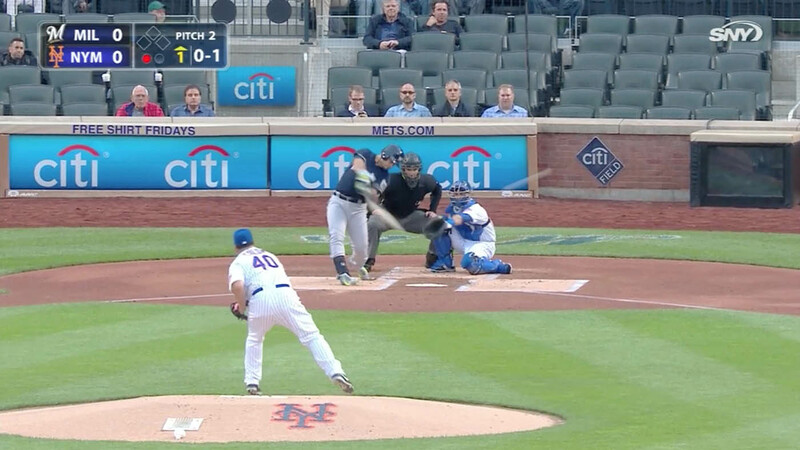 The first batter of the game was Carlos Gomez, and in true undisciplined/overzealous Carlos Gomez fashion, he swung at Bartolo Colon’s first pitch. Ground ball. One out. Whatever. 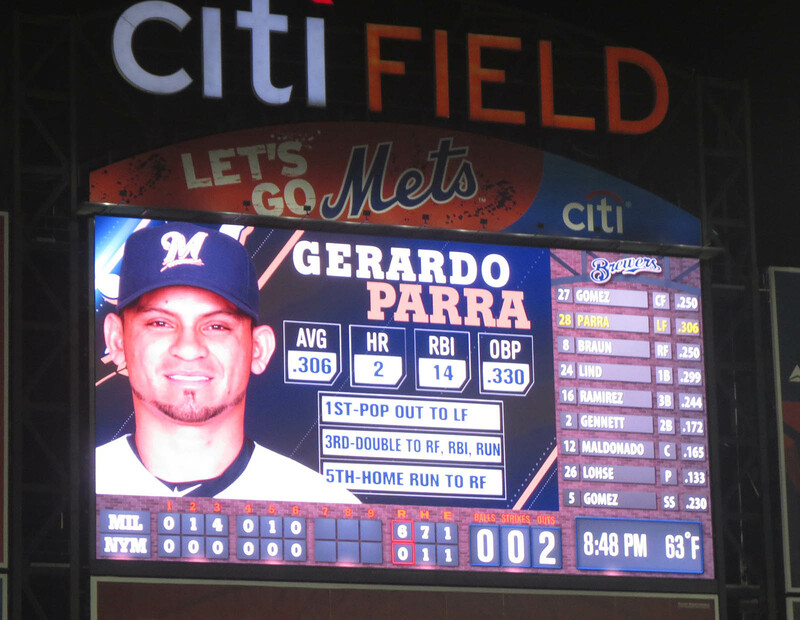 The next batter was Gerardo Parra. 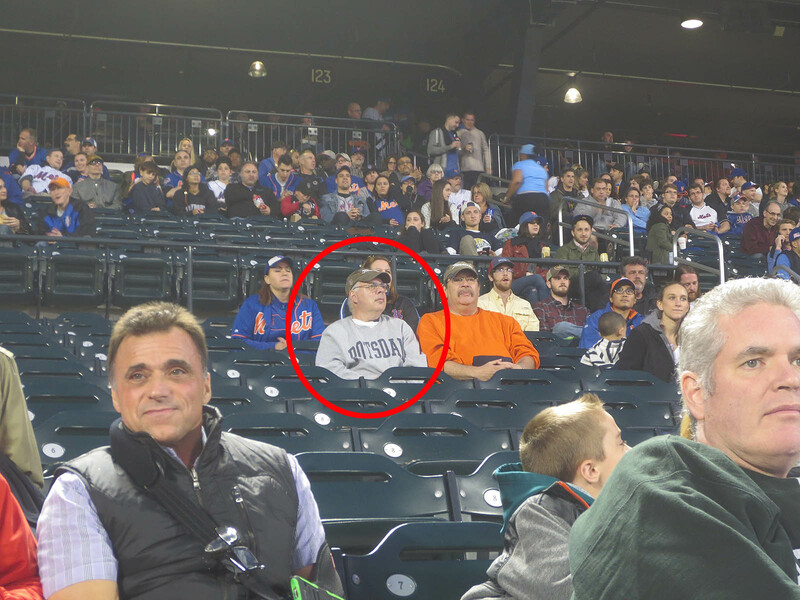 As he stepped to the plate, I moved a few seats closer. 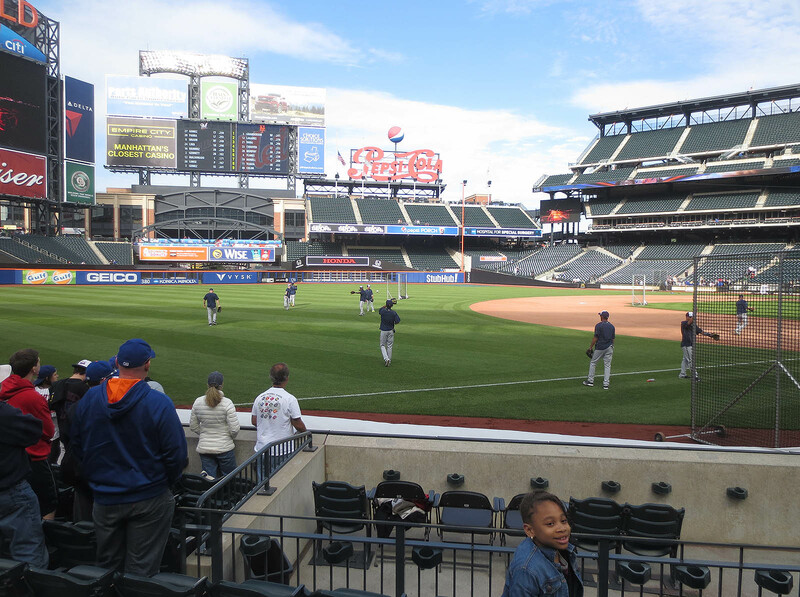 I was pretty much even with the outfield grass and probably 20 rows back, where it was nice and empty. 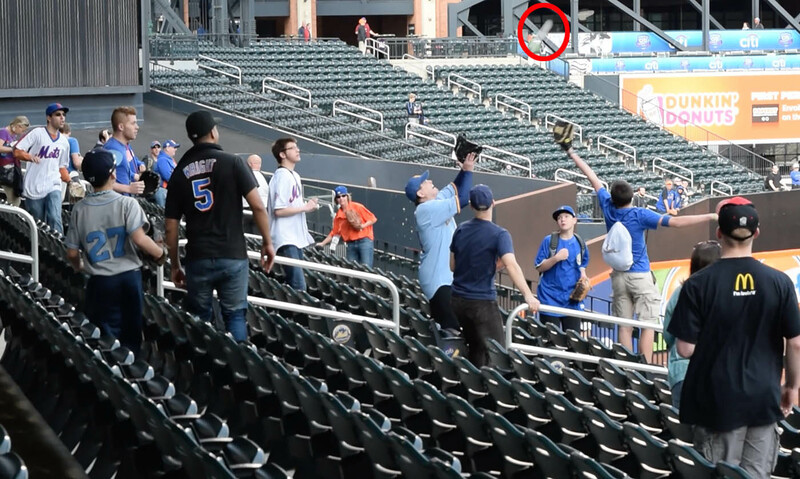 I wasn’t trying to catch a foul ball — just using the space as a path to a particular staircase behind the dugout. In case you can’t tell, the white streak to the right of the catcher’s head is the ball. Colon had thrown a 90-mile-per-hour heater, and Parra slashed it foul. Usually I expect every ball to be hit to me, and when it isn’t, I’m disappointed. In this case, however, I was stunned to see it flying my way — not just toward my section but pretty much toward my row! I jumped out of my seat and ran to my right. If I’d started half a dozen seats closer, I would’ve made a sweet running catch, but I was a bit too far away, so I had to watch helplessly as it zipped past me. 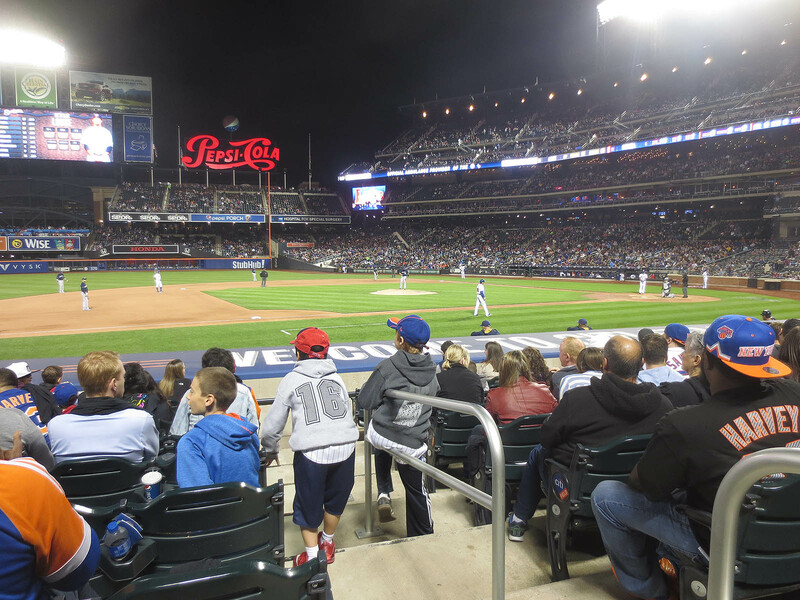 The ball smacked against the empty seats in the row just behind me and ricocheted back in the direction that I’d just come from. I was so excited and panicked all at once! I thought I had a great chance to snag it until it bounced right to one of the only guys sitting nearby. Why did that have to happen?! Why is my luck sooooooo bad?! How awesome would it have been for THAT to be my 8,000th ball? All these thoughts were rattling around my head, and then something incredible happened. The ball bounced off the guy’s chest and plopped to the ground at his feet. He had gray hair. He wasn’t wearing a glove. When the ball was hit, he hadn’t even bothered to stand up, so I didn’t feel the least bit guilty when I ran over and lunged for it. And then I felt it in my hand! Grabbing the world’s biggest diamond wouldn’t have made me nearly as happy. I’m still amazed at how the whole thing turned out. Rob Manfred. No Sharpie streak. And perhaps best of all, Ryan Braun had nothing to do with it (although the ball *was* pitched by a different steroid guy). I would’ve loved to move to the outfield and try to catch a home run, but the seats out there were packed, and eh, I just wanted to relax and have a nice view of the game. Thank you, sir! If you ever see this blog entry and identify yourself in person, I will buy you two concession items of your choice. Live large! Steak sandwich and a 25oz beer? You got it. But that was fine. I wasn’t feeling any pressure at that point. I didn’t get any more balls, but again . . . whatever. 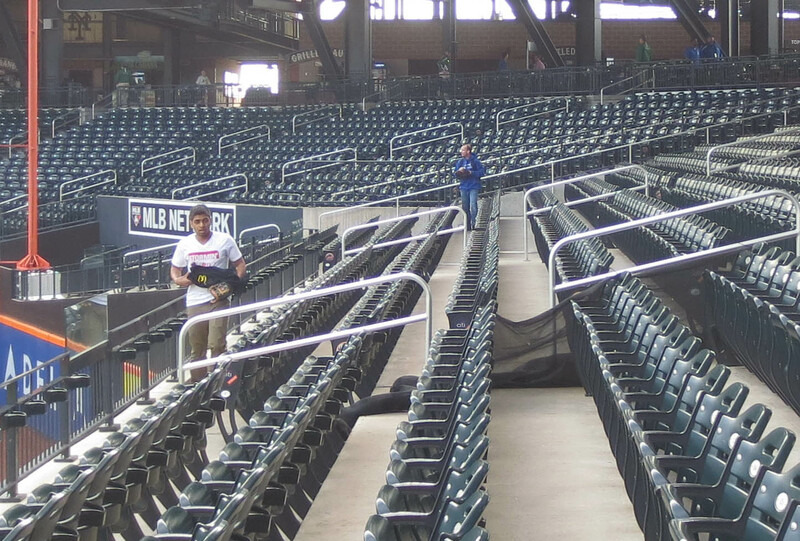 I was perfectly happy to take my time walking out of the stadium, stopping in the concourse behind home plate to give one of my BP balls to a little kid with an empty glove. I love the smudged logo. I love how everything turned out. I would appreciate some advice on getting Parra’s autograph. Just don’t ask me about ball No. 9,000 — I’m not ready to think about that yet. • 194 balls in 25 games this season = 7.76 balls per game. 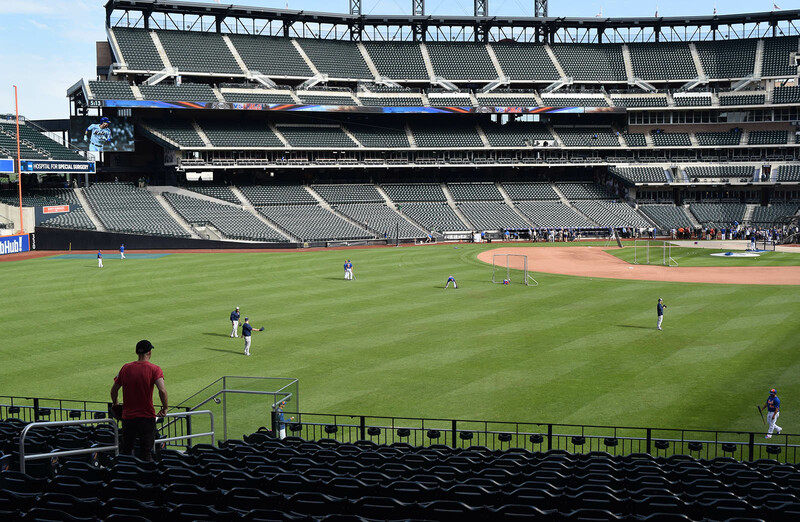 • 1,106 lifetime balls in 146 games at Citi Field = 7.58 balls per game. Can I be the first to congratulate you on 8,000?! I know I said this on Twitter already, but congrats on the incredible milestone. When do you predict hitting 5 digits? Great job getting a gamer for 8,000. Parra shouldn’t be too hard to get to sign. Great job!! Hopefully Parra will sign it for you. Did you ever get Rendon or Rios to sign the balls? What was with everyone wearing that McDonald’s t-shirt? Anyway nice game and I can’t wait to see you hit quintuple digits. Congrats Zack! I am still waiting for my first ball, only 8,000 until I catch up with you :) But I did get the 3rd ever home run hit at the St. Paul Saints new field. But really 8,000 balls is really impressive. Congrats! It’s interesting that it took you 2,538 days to go from 1,000 to 2,000 balls, when it took you 1,165 days to snag the first 1,000 balls. I’m guessing going to college had something to do with the longest time lapsed to snag 1,000 balls… The shortest was between 5,000 and 6,000, which took only 377 days; unfathomable! Congratulations on no 8000. You beat my lifetime total of 4 in BP. Long may you reign. Is anyone else even close to your total ? I`m guessing that if you had a Hall of Fame vote that the steroid guys wouldn`t be getting in. You would be a first ballot choice in the ball snagging HOF lol. An epic achievement. Good luck with the Parra signature. Who knows , maybe word will filter back to him. How is Heath Bell going with the Nationals [ I think ] ? Thanks again. If I maintain my current pace, I’ll reach 10,000 in 2018, but there’s always a chance that I’ll slow down. Thank you! I got Rendon to sign No. 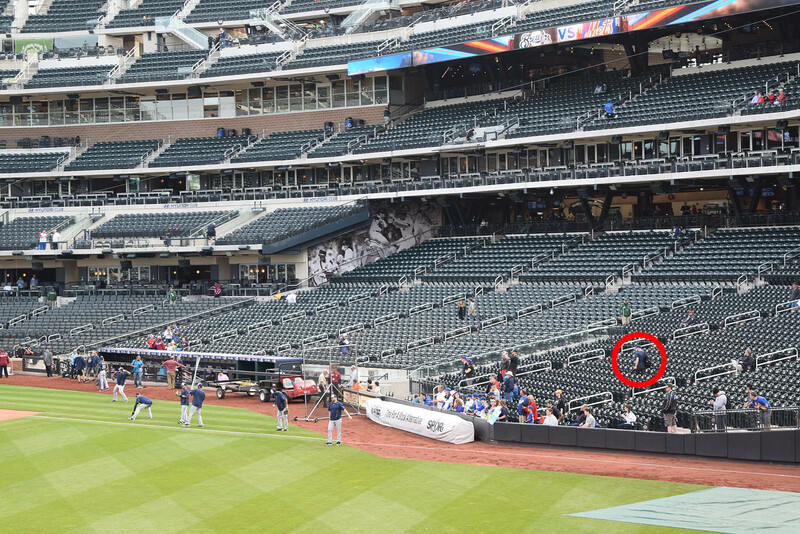 7,000 at Citi Field, but Rios has eluded me. 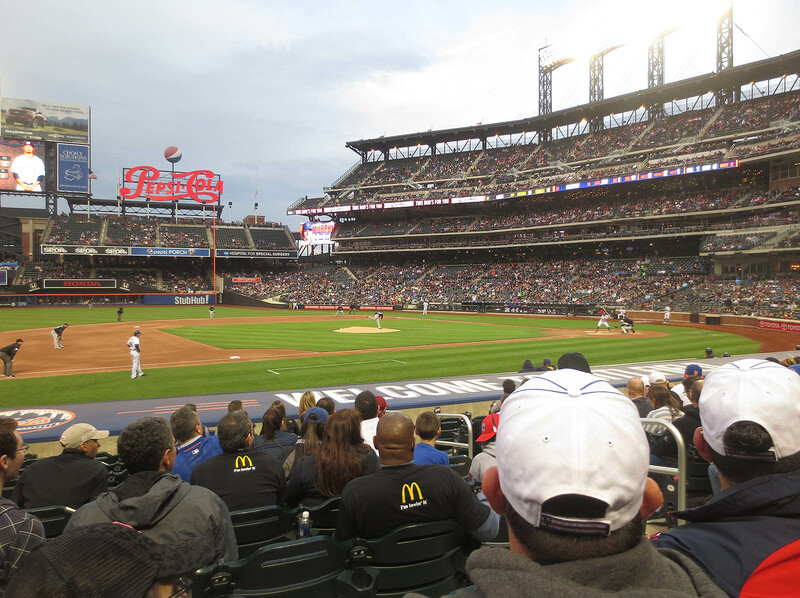 On Fridays, the Mets give away T-shirts, and at this particular game, it was sponsored by McDonalds. Ha, nice. 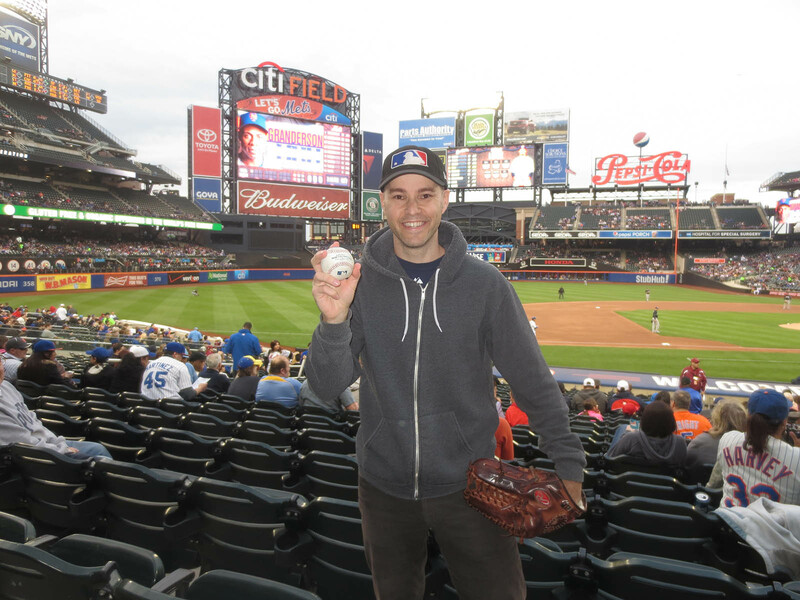 I hope you find a way to attend some MLB games and snag a few baseballs. Thanks for breaking down the numbers. Very interesting! After I reached 1,000, I thought I was done with it. Then I went off to college and only attended 10 games in 1997, and I don’t know, it just took me a while to really find my groove again. There are a few guys in the 4,000 to 5,000 range, so I have a good lead for now. I don’t think anyone else has snagged 6,000. Moe Mullins in Chicago is probably close if he hasn’t done it already. You’re right about my hypothetical Hall of Fame vote, but you’re wrong about Heath. He got released in Spring Training and decided to retire. I’ll always be sad about that. It would’ve been amazing to see him in the major leagues for another season. Hi Zack- pleasure to have met you last night with my wife. Sorry we interrupted mid-inning. 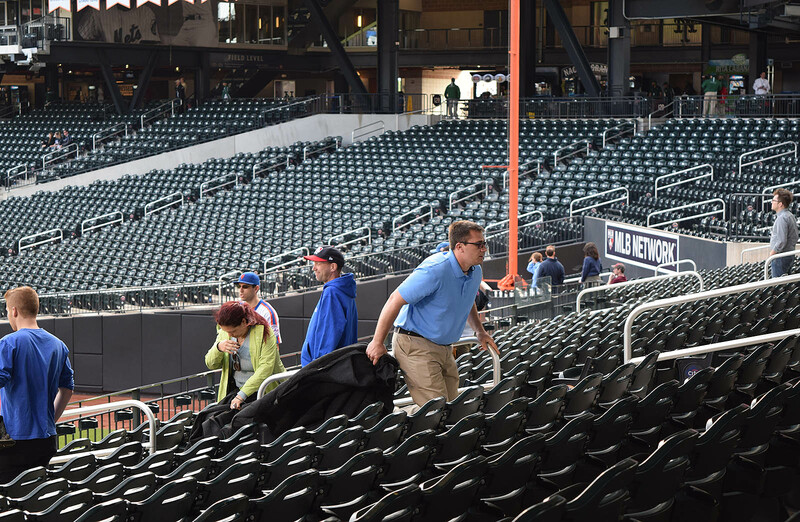 Tried to time it in between innings but the security guard in your section was…challenging. Funny how you said Didi wasn’t going to hit a homer when he was up while we were talking, but a little while later he somehow launched one! Hope you make it up to Boston sometime this year. Your first Sam Adams is on us. Congrats on 8,000, man! I’ll buy you a ticket next year to get 9,000 in Cleveland. May 24, 2015 - 10:41 am Dennis B.
You’ve got a lot of balls! Congratulations on a very meaningful 8K! Thanks. I *do* like the idea of snagging #9,000 in Cleveland. But I might keep it closer to home and do it in Philly instead. Let’s discuss next year. Zack, congratulations on yet another snag! I look forward to the autograph blog entry, and good luck getting it signed. On a completely unrelated topic, is A-Rod fan friendly? I’m trying to get an autograph from him before HE announces a retirement. Any tips? Nice job Zack! Congrats on 8000! Thanks. 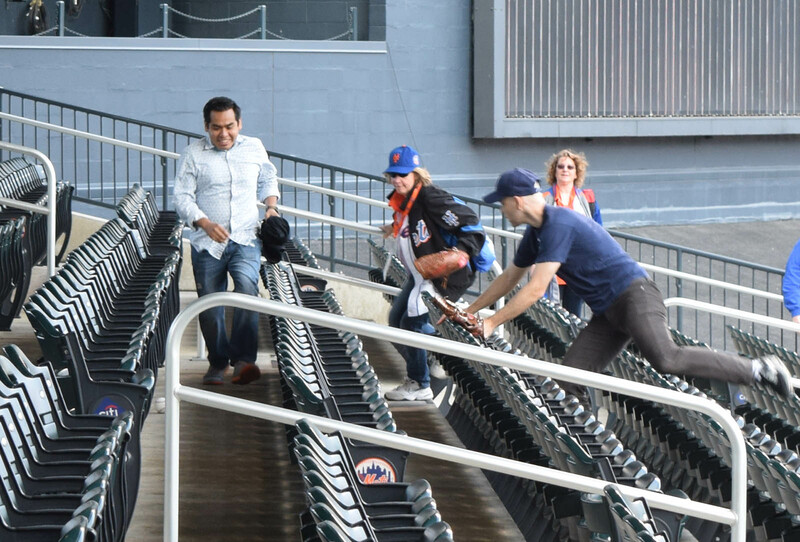 A-Rod is actually pretty nice if you can get near him, and he does sometimes sign at length inside stadiums. About seven years ago, he signed for about 45 minutes before the game in Baltimore. He started near 3rd base and basically went down the entire line to the foul pole. I hope that helps. 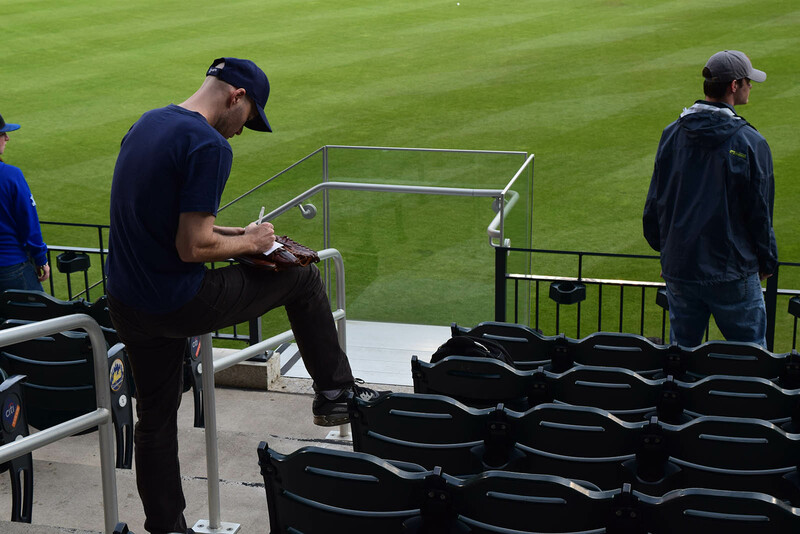 I can’t remember ever seeing him sign at the new Yankee Stadium — maybe for a few folks here and there in the ultra-fancy seats. Let’s start talking about your 10,000 ball!!! LOL nice snag Zack! Camden Yards! That’s where I want to snag it.